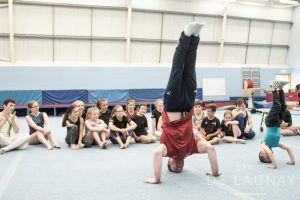 Young gymnasts from all over Scotland and their coaches were treated to an experience of a lifetime during this year’s annual disability gymnastics camp when none other than Dan Purvis – multiple Olympic and Commonwealth medalist – made a surprise appearance during training. The camp, which is now in its 3rd year, took place at Aberdeen’s Alex Collie Centre – a dedicated gymnastics facility – and provided 20 gymnasts with an opportunity to access a wealth of training opportunities in all disciplines of the sport including Artistic, Rhythmic, Acro & Team Gym, and enabled 21 coaches to share learning & gain experience of working with athletes with a range of impairments. 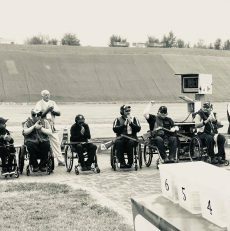 The visit by Purvis, along with Patrick Bonner from the British Gymnastics Foundation, had been kept a closely guarded secret by organisers Lorna Presly & Lydie Slater, and their arrival sparked huge excitement from everyone involved. Purvis even went above and beyond the call of duty to make the experience unforgettable for the youngers by leading the group warm-up, coaching the artistic elements of the camp, joining in with training exercises in all disciplines, and taking on some of the youngsters in fun challenges! Lorna Presly, camp organiser, said “What an amazing camp we had this year; it went away above my expectations. To top it off, having our special guest Dan Purvis this time, who spent the whole day, and evening with us all. To see the gymnasts, and coaches faces when he walked into the gym, was a moment I will never forget, the excitement and disbelief of their idol standing there…We can’t thank Patrick Bonner from the British Gymnastics Foundation enough for arranging this. A big thank you also to the coaches who helped make it a camp to remember”. The event, run entirely voluntarily, was established to foster collaboration between all of the Scottish clubs, enhance the quality of disability gymnastics coaching, help the gymnasts reach their potential, and raise the profile of the sport. 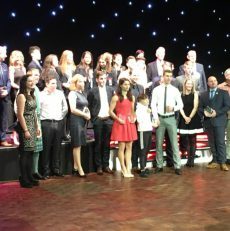 The involvement this time round of the British Gymnastics Foundation showed great support for the development of the sport. As well as the British Gymnastics Foundation, the organisers would like to extend their thanks to Grampian Disability Sport, City of Aberdeen Gymnastics, Denise DeLaunay Photography and Scotmid Co-op for their support.